Properly caring for your products. Professionals know that there are four areas of knife care and maintenance to assess in order to keep your cutlery in top shape. We’ve put together a list of DOs and DON’Ts to help you cover every area. Learn how to care for stainless steel. Your stainless steel is a staple in foodservice kitchens, and when properly looked after, it can be found shining everywhere from your countertops to the sinks, work tables, refrigeration, and the cooking and ware washing equipment. 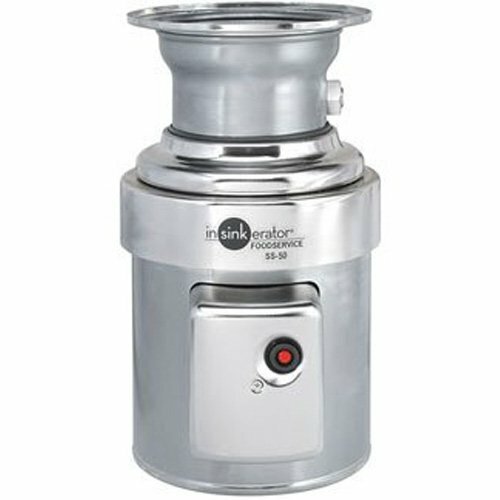 There are a number of reasons for this prevalence, but mostly, stainless steel is used throughout because it is very durable, safe for food preparation, resists corrosion moreso than other materials (resist is the key word here), and it is nonporous, so moisture, bacteria and other harmful remnants can’t easily seep into the material. Before use, it’s always important to season your non-stick cooking surfaces. Open the waffle and season the griddles with cooking oil using a paper towel. 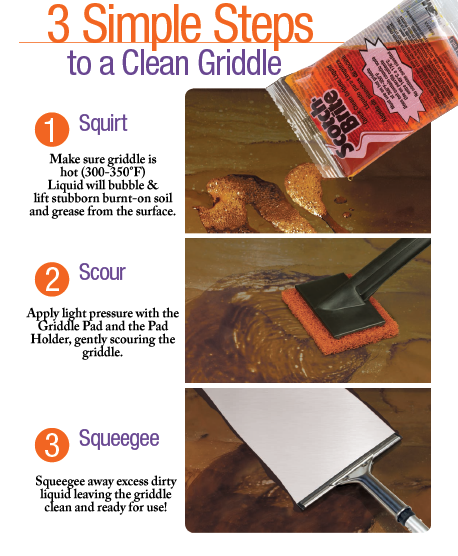 Wipe off excess oil and discard the first waffle or two, which will more than likely be oily. The operating light will turn on when the waffle is plugged in and begins to heat up. After about 5 minutes, the light will turn off, telling you the griddle is nice and hot, and ready for your mix! The light will stay off and the griddle will stay hot as long as the unit is plugged in. Use roughly 2/3 cup of pancake or waffle mix per baking cycle! Once poured on the griddle plate, the ready light will turn on and you can close it lightly. *Be sure not to push it tightly closed as the waffle will need to steam and rise as it cooks. When the waffle is ready the ready light will turn off. Cleaning your Texas Waffle Maker is very easy and should be done after the unit has completely cooled off. Do not clean the waffle maker when it is still hot. This Texas Waffle Maker cooks fast thanks to its 800 watt grill plates, and it should be completely cool so you don’t burn yourself in the process, or warp the elements. When it’s cool, simply wipe down the grill plates with a damp sponge of soft cloth and do the same with the outside of the waffle maker. Avoid using abrasive elements to scrub and resist from applying chemical cleaners directly on the unit. Ready to purchase your own? 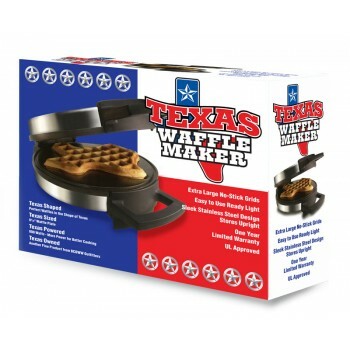 Head on over to the website to pick up a Texas Waffle Maker for your own kitchen and feel free to give our sales team a call at 800-319-0690 Monday through Friday, 7 AM to 7 PM, with any questions! 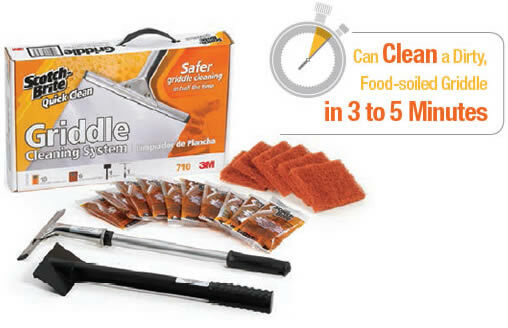 Though not one of our most glamorous products, this complete Griddle Cleaning Kit by 3M is truly one of our best-selling ones, and for good reason! There is no better gratification than taking a nasty, greasy griddle and making it new again. This complete kit cleans in half the time of traditional cleaning products and includes all the essentials to make sure you get that fresh, restored clean in the smallest amount of time. 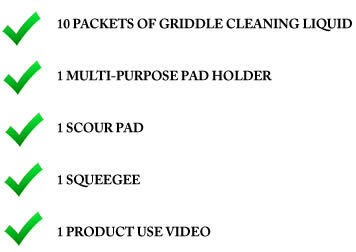 The kit comes complete with: You can pick up your own Griddle Cleaning System on our website! To get the best performance and life from your new bake pan, be sure to season it before use, and as needed over time. Simply apply a spray or lubricant to the surface and stick it in the oven (without product in it) for 10 minutes at roughly 350°F. Baking Pans should always be stored in warm, dry areas and away from places with high humidity, like the dishroom. Baking pans should never be stored in cool/cold places since condensation can form on the pan. They should be placed upside down in their designated storage place for the best airflow and we often recommend warming them in the oven just before storage to make sure they are completely dry and free of moisture. 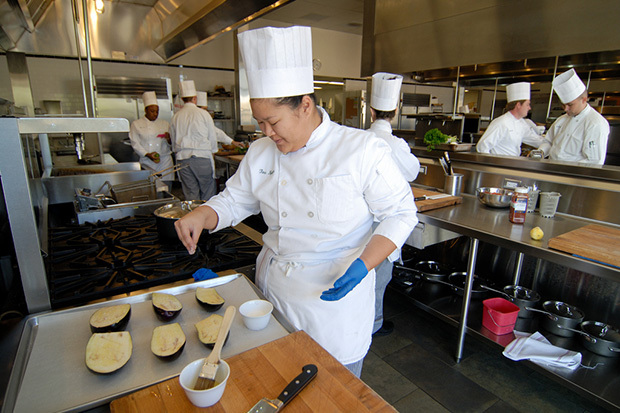 After baking, your finished product should be depanned as soon as possible. This is because steam given off from the pan during the cooling process can penetrate the glaze on the pan and cause “glaze lifting” or corrosion over time. Many people think to keep the baked product in the pan long enough to cool it is the correct thing to do, when in actuality it can damage the pan over time. 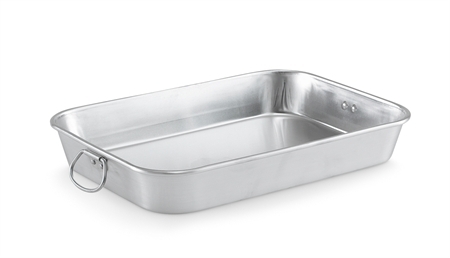 Baking Pans are relatively sensitive and should be cleaned with a soft cloth or a mild soap and water solution. Remember that pans shouldn’t be exposed to water, humidity, condensation or cold temperatures if possible. Avoid soaking the pan in water, using any harsh chemical cleaners, in addition to rough scouring pads which can scratch the glaze on your pan. 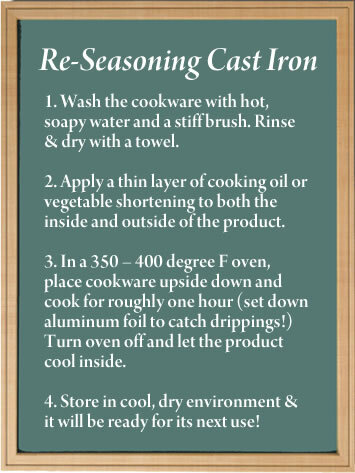 Should washing in water be necessary, re-season the pan with a lubricant afterwards and stick it in the oven at 350°F for 10 minutes to ensure the seasoning has sealed. 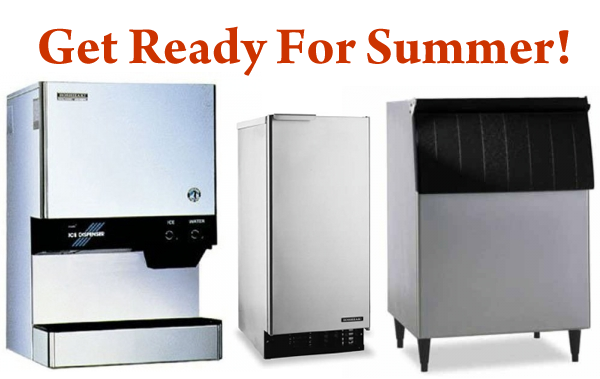 In the hot summer months, the demand for ice in your restaurant or place of business goes up dramatically. 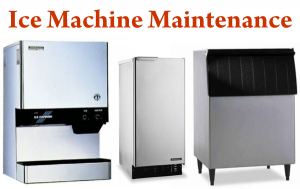 Therefore, it’s important to take extra maintenance precautions on your commercial ice machine(s) so you can extend the lifecycle of the unit while ensuring the cleanliness and purity of your ice. Remember, your ice is important to your customers and to the overall quality of your drinks. The most common analogy to help prove the importance of commercial ice machine maintenance is to think of your ice machine as a car. If you never maintain the car, change the oil, etc., it will eventually burn up and destroy the engine. Your ice machine is the same way. When it’s working hard, particularly in the summer months, to produce a sufficient amount of ice for your demand, it’s vitally important to maintain the machine often and regularly it so it doesn’t wear down. No ice on a hot summer day = unhappy customers. How Often Do I Need To Maintain My Machine? Maintenance frequency is largely dependent on the usage. The general rule of thumb is that your machine should be serviced every 6 months. However, this largely depends on what kind of kitchen and demand you’re talking about. Fast food chains, drive-thrus, delis, and other places would be advised to maintain their unit on a more regular basis to prevent the build up of scale and other impure substances that could harm the taste, clarity, and quality of the ice. 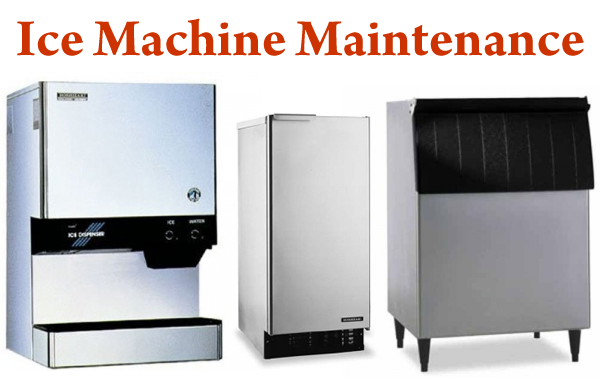 Heat is one of the biggest factors that can cause poor ice machine performance but so is neglecting to service it. Make sure the condenser coil and the evaporator are clean so production doesn’t slow down. Our Suggestion For You We suggest scheduling a professional service and maintenance at the beginning of the summer. Having an authorized service agent physically take apart the unit, clean all the parts, sanitize it properly, change out the filters, and put it back together will ensure optimal, hassle-free performance when you need it most. To find a local, authorized service agent call the Manufacturer of the Ice Machine you have to schedule an appointment! Other Helpful Tips & Ideas: 1. The next time you’re looking to invest in a new machine, think Energy Star. We have lots of Energy Star Rated Ice Machines that will rake in 10% more water savings and 15% more energy savings than comparable, non-Energy Star Rated units! Look for that blue square on the product pages to know whether it's an Energy Star Rated Product! 2. Keep the Machine in a Cool Place in the Kitchen (if possible) 3. Set the machine to run overnight for added energy savings 4. 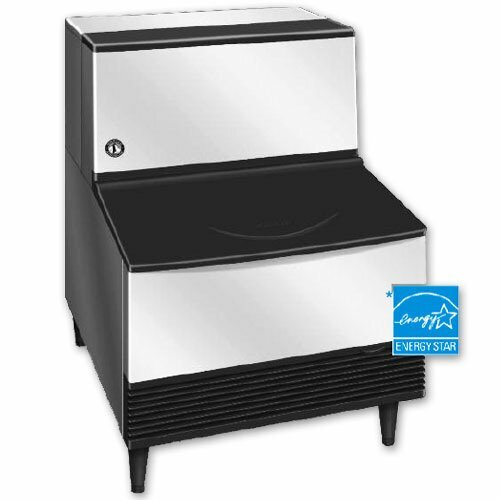 It’s easy to forget about regular maintenance, so keep track of service dates and plan ahead so you’re always on top of the proper maintenance schedule Check out all the Commercial Ice Machines available on MissionRS.com! Have you Read our Blog on Equipment Care & Cleaning Tips??? 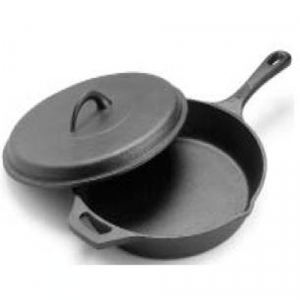 Don’t use soap or detergents for cleaning cast iron- hot water will do and a sponge! 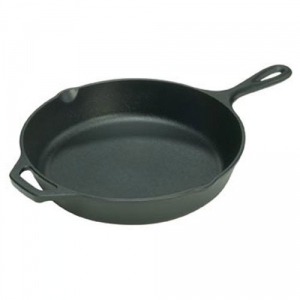 Check out our wide selection of Cast Iron Skillets and Fry Pans! 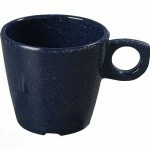 These mugs are no longer available through Carlisle or through MissionRS.com. If you or your company has purchased either of these product skus anytime between January 2011 and January 2012, please contact Carlisle for an immediate return and credit. 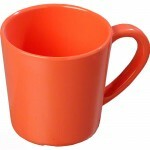 Consumers should stop using the mugs immediately and return them to Carlisle for credit towards a future purchase of Carlisle FoodService Products merchandise. Carlisle will provide instructions for free return shipping, and for any further information, please contact Carlisle FoodService Products at (800) 217-8859 between 7:30 a.m. and 4:30 p.m. CT Monday through Friday. Though we only stocked two of the models within this list, be advised that the entire list below is being recalled: Sierrus™ Mug 7.8 oz Model # 33056 Durus® Challenge Cup 7.8 oz Model # 43056 Dallas Ware® Stacking Cup 7 oz Model # 43546 Dayton™ Stacking Cup 7 oz Model # 43870 Kingline™ Ovide Cup 7 oz Model # KL300 Kingline™ Stacking Cup 7 oz Model # KL111 Melamine Stackable Mug 8 oz Model # 4510 Cappuccino Mug 12 oz Model # 4812 Cappuccino Mug 16 oz Model # 4816 We’re sincerely sorry for any inconvenience this may cause you, yet we know that by putting safety first, this could avoid major injuries and accidents in the future. Almost every business has plumbing, but during renovations and maintenance, it can be one of the most important but neglected realms of restaurant equipment. A faucet seems ageless, a grease trap eternal, but proper upkeep and testing of these plumbing supplies and fixtures is essential to maintaining the sources and uses of water–the lifeblood of any restaurant. Especially in colder regions, winter power outages can drop the temperature of buildings below freezing, putting even the pipes on stainless steel utility sinks at risk to burst. A small drop in water pressure can render any rinse unit completely useless. General wear and calcium buildup also ages and corrodes faucets and the cogs in large utility dishwashers. Every restaurant, café, or deli depends heavily on cleanliness, both for health codes and practicality: a malfunctioning sink can cripple an eatery by stockpiling dirty dishes, and without any source of water, cooking and brewing become impossible in a matter of minutes. The key safeguard against such a paralyzed business is simple servicing to test the proper functioning of plumbing equipment. 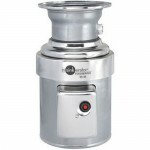 Old water filters and disposals in particular have a high likelihood of sudden breakdown, so an investment in more modern machines might be a wise one. Otherwise, keeping spare parts like spindles and replacement valves on hand can be an inexpensive prevention technique. But the most important action is simply not to ignore plumbing. Refrigerators and ranges may be used more consciously, but the fixtures supplying water are indispensable to an operative business. Shop all plumbing supplies and equipment at Mission Restaurant Supply!